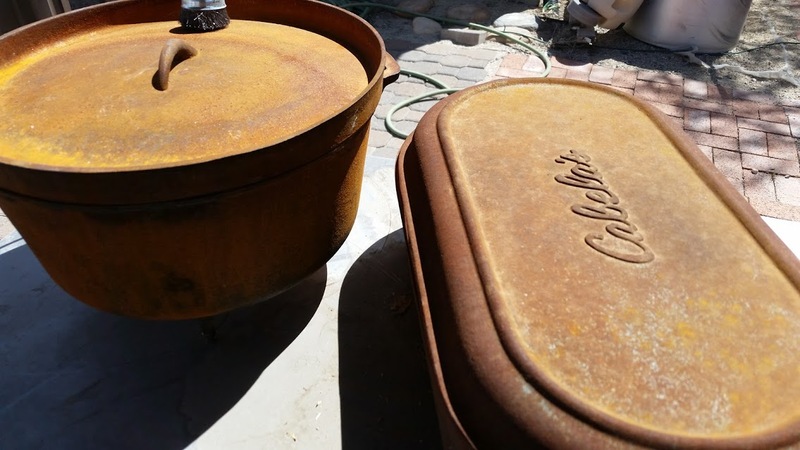 MarksBlackPot: Dutch Oven Recipes and Cooking: Dutch oven Restoration and Reseasoning. 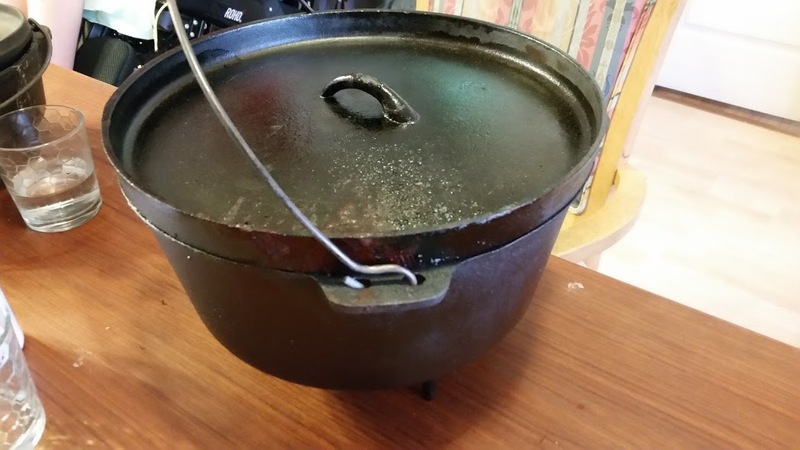 Dutch oven Restoration and Reseasoning. 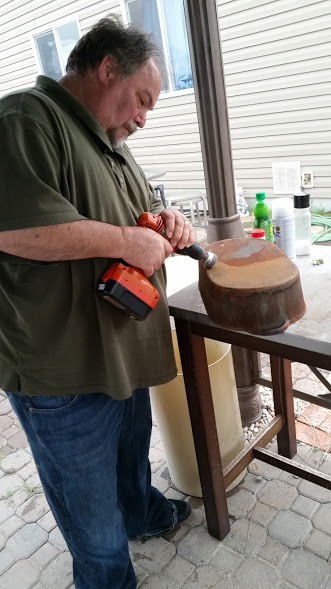 Last week, my neighbor let me take his Dutch oven and “rehab” it. 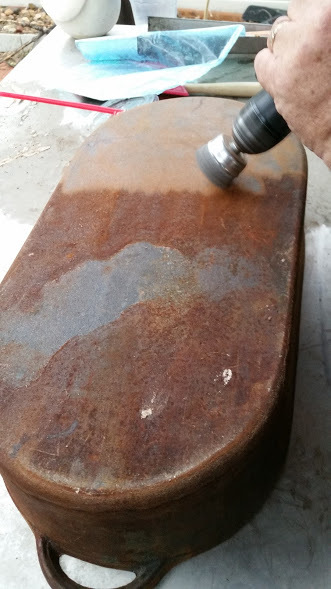 As you can see from the pictures, it was pretty badly rusted. I did one of my own that had gotten all oxidized as well. Here, you can see a pic of them both. Mine is the long, oval one. I started out by cleaning them off, using a wire brush attachment to my power drill. It wasn’t easy. My hands and wrists got really tired, and I had to do it in stages. Here’s a few pics of that process. Then, I heated up my gas grill. I much prefer the grill because the process smokes a lot, and I’d rather not do that inside. 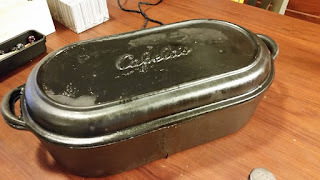 I adjusted the burners so that, with the lid down, it measured at about 500 degrees. I coated the Dutch ovens in vegetable oil. I normally like to use shortening, like Crisco, but I didn’t have any there. I put the oil in a spritz bottle to get better coverage. Then, I set one of them into the grill, upside down, with the lid separate (also coated). My grill wasn’t big enough to do them both at the same time. I let it bake for about a half hour or so, then (using heavy leather gloves) took it out and spritzed it again. It went back in for another half hour. The first one, I pulled out to cool. The second one, I just left in the grill and turned off the gas. Might need to check your post from another machine, no pics visible, at this time. Oops! Hopefully, you can see the pics, now! Thanks for helping out!